What this formula does is count how many times the current item in the list has occurred so far, including the current row. If the count is one, it increases the count by one, treating the item as a unique value. If the count is more than one, the current item is treated as a duplicate and the number does not increase. Copy (or fill) down the formula from Step 2 to the row containing the last item in the list. Rows($B$2:B2) is 1, but as the formula is copied down, becomes, 2 (for Rows($B$2:B3), 3 (for Rows($B$2:B4), etc. What this formula does is, by way of VLOOKUP, check the first column (A) in the range $A$2:$B$8 for the value resulting from the function Rows($B$2:B2). Again, this will result in 1, 2, 3, etc. (for as many rows as you copy or fill down). Once the formula finds the first instance of that number, it will stop. It then returns the value in the same row from the 2nd column. Finally, the “0”, which is almost always used, tells the vlookup formula to return an exact match, not the closest value. The IFERROR() function is wrapped around the VLOOKUP, used to replace any errors (#N/A) returned by the VLOOKUP function (after the last unique value has been found) with a blank. 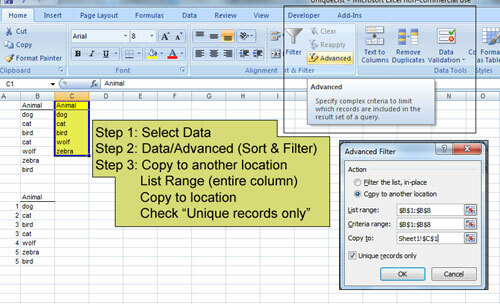 Copy (or fill) down the formula from Step 4 to the row containing the last item in the list.